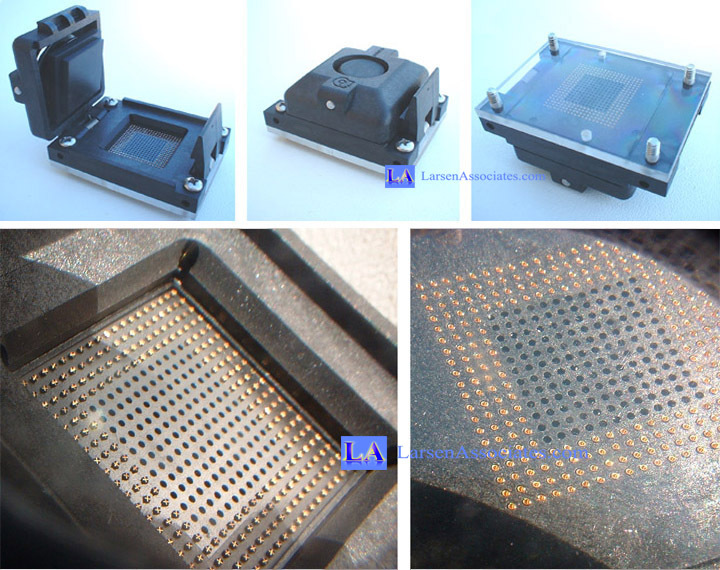 Chip Scale Test Sockets & Burn-In sockets for MicroBGA, DSP, LGA, SRAM, DRAM, QFN, Flash Devices, ANY SMT device 0.2mm Pitch & Up. 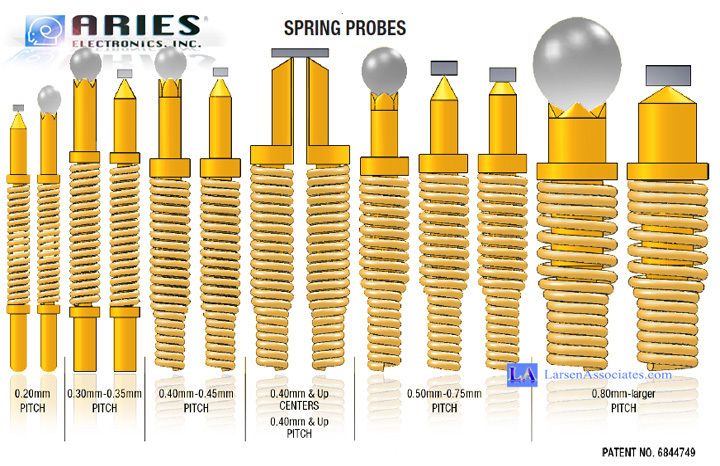 "Aries, world leader in test socket technology"
Now available .2mm pitch and up. .
Shows Spring Probes, top and bottom, typical of the Aries Clamshell type test socket family. 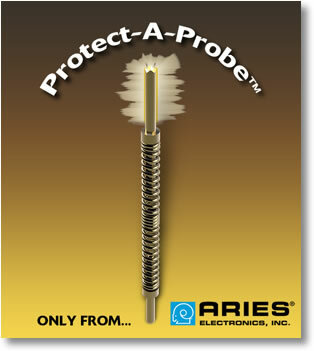 Protect-A-Probe™ anti-diffusion, gold coating for its complete line of burn-in and test socket spring-probes. The Protect-A Probe™ coating is designed to lessen or eliminate the need for probe cleaning, by applying its proprietary, anti-diffusion, gold coating onto the probe before assembly. This coating, once applied, acts like a “Teflon” barrier preventing solder and other debris from adhering to the probe tip. This lessens (or eliminates) cleaning, which reduces downtime and increases throughput! When used in HAST, HTOL or standard burn-in applications this can prevent the IC solder balls/bumps from “sticking” to the probe causing damage to the IC and/or socket. When used in test (including RF testing) applications, a probe that stays cleaner, longer, will yield more consistent contact resistance (CRes) readings over a longer period of time. This saves time and money. This coating has been tested in a socket with an IC which had SAC405 balls on 0.35mm pitch for over 1500 hours at 150°C. No debris or IC or socket damage was noticed. This coating is now available for the Aries’ complete line of spring-probe, standard and custom Test and Burn-in Sockets as well as the complete line of spring-probe based RF Test Sockets. Note: Please review the data sheets below. The drawing on the data sheet for the standard ized body molded sockets shows layout of the socket less the interior portion that is modified for your exact device. For your layout, the center datum point is a common dimension for both the IC and socket. Actual drawings with your device are generated for your approval after receipt of order. Fully machined sockets can be any layout and size. Custom sockets are to your exact needs. Signal Path Length: 0.005" and 0.007"
Signal Path Length: as short as 0.077"
Signal Path Length: as short as 0.011"
For Any SMT device, .2 mm pitch & up.